It certainly is an amusing irony that one of the most graphically violent war films ever made is in fact about a man who refused to pick up a gun. The subject of Mel Gibson’s heartfelt biography is Desmond Doss, an American pacifist who served in the U.S. Army during World War II . After the attack on Pearl Harbor in 1941, Desmond believed deeply in the cause. However, as a devout Seventh-day Adventist, he had also vowed not to take a human life. Consequently, he decides to become a combat medic. In this manner , he could serve in a unique way. It was during the battle at Hacksaw Ridge, on the island of Okinawa in 1945, that he would be put to the test. This was one of the bloodiest battles of World War II. By the end, Desmond would save 75 soldiers all without using a gun. He later would become the first conscientious objector to be awarded the U.S. Medal of Honor. To be fair, he didn’t refuse to wear the uniform. He was a different kind of “conscientious objector”. Desmond Ross was an unlikely hero. That makes him a powerful focus at the center of Mel Gibson’s drama. Thou shalt not kill. Desmond Doss took the commandment seriously. His conviction was formed as a young boy growing up in Lynchburg, Virginia. In the prelude, we see the events that lead to his enlisting. While play wrestling with his sibling one day, the young lad nearly kills his brother Hal with a brick. The incident had a profound effect on him. His upbringing was one of contrasts. A religious mother (Rachel Griffiths) paired with an abusive, alcoholic father (Hugo Weaving) who also happened to be a veteran of World War I. They both molded his personality. As a young man, he meets a nurse named Dorothy (Teresa Palmer) and she becomes his sweetheart. They get married. The movie is skillfully split into three parts. In part two he goes off to boot camp. It is there that he is chastised and ridiculed as a coward for refusing to carry a weapon. The ensemble highlights several soldiers that manage to stand out in brief vignettes. He faces verbal and physical attacks. Not just from his fellow soldiers, but also from his commanding officers, Sergeant Howell (Vince Vaughn) and Captain Glover (Sam Worthington). They clearly try to break him. Vaughn is particularly memorable in a small part. He brands the men with nicknames like “Tex,” “Hollywood,” and “Ghoul”. Although his relentless drill sergeant is a stock character (Full Metal Jacket anyone?) Vaughn unquestionably galvanizes the narrative. It’s been years since the actor had a part this invigorating. In the final third, Desmond goes into the combat zone. Here is where the picture presents the battlefield like hell on earth – the deluge of wounded men evokes, for lack of a better word, hamburger meat. When/if you see the film you’ll understand why that description is pretty apt. Mel Gibson isn’t one for subtlety. He paints with broad strokes, but his simplicity has an emotional component. Gibson has always been moved by blood and viscera. Whether Braveheart or Passion of the Christ or Apocalypto, he uses violence like a gut punch to the psyche. And yet here the gore feels earned, almost necessary. The narrative certainly succumbs to exploitative tendencies, but only in the tertiary act. The director’s fervor is so credible the viewer is persuaded by his faith. Andrew Garfield plays the man with an aw-shucks southern mentality that makes him easy to embrace. I understood what made Desmond Doss tick. That’s a major success for any biography. 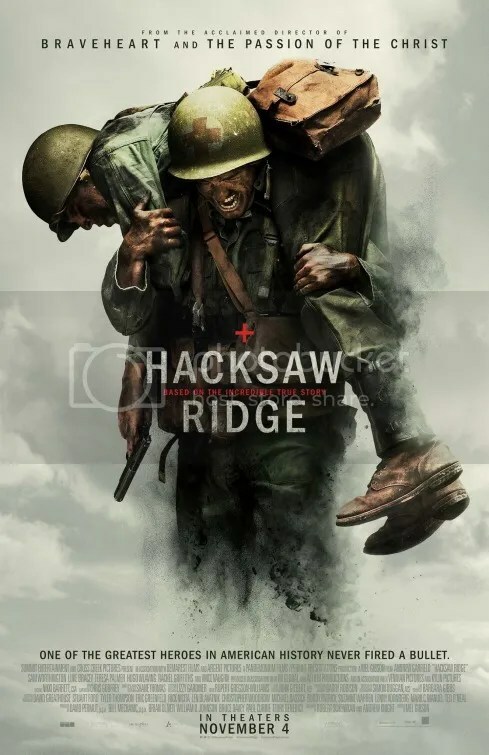 Hacksaw Ridge is unexpected. I was anticipating another “war is hell” melodrama. Yes ok, it is that. I likewise got a surprising tale of faith as well. A man whose unconventional beliefs made him a social outcast. An inspirational account of heroism presented without qualification, as simply “a true story.” Not based on. In keeping with the nature of the subject, that’s an audacious label. Over time, his determination forced people to accommodate to his eccentricities until he ultimately won them over through sheer ability. The saga of Desmond Doss is a passion project through which director Mel Gibson undoubtedly identifies with the man. The chronicle is pretty inspiring and Gibson extracts the excitement out of the drama in classic fashion. Even when he is delving in clichés, he brings such heart and intensity, you can’t help be won over. This entry was posted on November 14, 2016 at 11:22 am and is filed under Drama, History, War with tags 2016. You can follow any responses to this entry through the RSS 2.0 feed. You can leave a response, or trackback from your own site. Sorry Mark, I just couldn’t take this film seriously, I actually laughed at the gore, so OTT, it was like watching some low budget Zombie flick. This film was just far far to schmaltzy for me to take seriously. Amazing story & very well made, but no not for me. “…laughed at the gore, so over-the-top…” Hmmm it fits within a tradition of war films that include Saving Private Ryan (1998), Black Hawk Down (2001), Letters From Iwo Jima (2006) and Fury (2014). Did you find those funny too? I haven’t seen it, Mark, but many seem to like it. I appreciate your review and hope to see it soon. I was skeptical. Boy was I was taken aback. Much more powerful than I was expecting. You are a smart man with insightful reviews. I look forward to watching it. I forgot how charismatic Vince Vaughn can be. He hasn’t been this memorable in a serious role since Swingers. I thought it was #1 on your list when you posted after seeing it. What’s #1? P.S. I saw your post on Facebook awhile back and I could’ve sworn you had Hacksaw Ridge at #1 right after you saw it. It stuck with me. Not because I didn’t agree. I hadn’t seen it yet. Just because I knew you were trying to decide whether to see it at all. Am I crazy or did you make an adjustment? Fine review. I’m a big fan of this one. Gibson hasn’t missed a beat. Hard to believe it’s been a decade since he directed a film (Apocalypto). Havnt got a chance to see this yet but glad you liked it and I am looking forward to it. I just started a movie blog myself for college and I am graded on interaction such as followers, comments and likes. I would really appreciate if you could give it a look. Thanks! It is certainly ironic that one of the most violent war films is about a pacifist. I’m sure the irony is intended by Gibson. Like you say, he isn’t one for subtlety. I’ve heard that the various sections of the movie feel pretty disconnected, especially the training vs wartime portions. Not sure if you had that experience. I agree that helping you understand what makes someone tick is impressive for a biography, and the story that the movie tells is a fascinating one. There’s something interesting about how Doss won people over and earned their respect. I could see that making a compelling tale, even if it’s a simplistic one. I didn’t find the movie disconnected. Structurally, the two parts were a little reminiscent of Full Metal Jacket actually.